This is the beginning of The Advocate's new column that will keep tabs on the day-by-day resistance movement against Trump. Living in Donald Trump’s America seemed like a far-off nightmare. Until it became reality. But now we are in it. Day one was shocking, as this Twitter moment shows. The hate-crime attacks. The race-fueled verbal attacks. The vandalism. The fear. This is not "the new normal." And here at The Advocate, we are following in The New York Times' Charles Blow’s footsteps. Count us as part of "the resistance" he signed up for in a column after Trump's win. From now on you can trust us as your source for resistance against Trump. As an LGBT publication, we believe in advocating for the rights of LGBT people. We will not stand behind a president who has threatened to take away our hard-earned rights. We will not stand behind a vice-president who believes in conversion therapy for LGBT people. 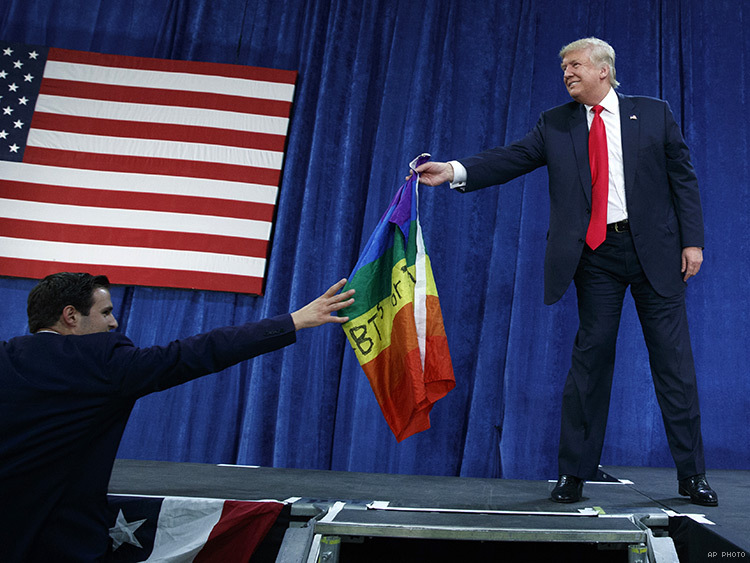 Mike Pence hasn't only said he would take away the rights of LGBT people, like Trump. He has shown us that during his term as governor, he did take away the rights of LGBT people in Indiana. There's no time to wait around and see what happens. We're going to cover Trump resistance news here each week. So what’s going on in The Resistance this week? A collection of tweets from day one of the president-elect's term that show the hate attacks fueled by Trump's bigotry. Bernie Sanders says he is prepared to work with Trump (if he is serious about pursuing policies that improve the lives of working families). President Obama: "Give Trump a Chance." Hillary supporters started a petition addressed to the Electoral College, asking it to give the presidency to Clinton because she won the popular vote. The petition has more than 3 million signatures. Do you follow Shaun King on Twitter or Facebook? King's feed has been the go-to source for keeping tabs on hate crimes fueled by Trump. Sen. Harry Reid says that if Trump is serious about uniting the nation, he must accept blame for using hate and bigotry to fuel his campaign. Winning the electoral vote does not absolve Trump of the sins he committed against the country, wrote the senator. If you want to receive email updates from The Resistance, such as this article, subscribe to our newsletter below.